Rama Navami is a Hindu festival, celebrating the birth of the god Rama to King Dasharatha and Queen Kausalya in Ayodhya. 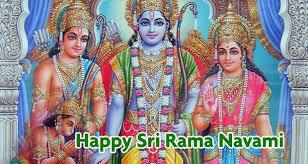 Rama, the seventh avatar of Vishnu, is one of the oldest avatars of Lord Vishnu having a human form. The holy day usually falls in the Shukla Paksha on the Navami. Thus it is also known as Chaitra Masa Suklapaksha Navami.